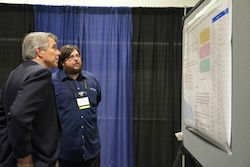 James Anderson discusses his research with an attendee during #NBB16. It’s never too early to encourage the next generation of biodiesel and bioproduct scientists and this is just what NBB is doing through its Next Generation Scientists for Biodiesel program. Several members of the group attended this year’s conference and presented posters, attended educational sessions and networked, networked, networked. James Anderson, at the University of Southern Illinois, serves as co-chair for the group and he presented his research looking at fatty acid profiles and studying divergent plants. His goal was to identify not the fastest growing soybean plant or the plant with the best resistance, but the plant with the best profile. The idea is that they would identify soybeans that would be even better suited to biodiesel production. He and his team checked their results against some USDA studies and found positive results. James is finishing up his project soon and will be awarded his PhD and will soon be looking for a job…hint, hint. He can be reached via email to discuss both his research and future opportunities. 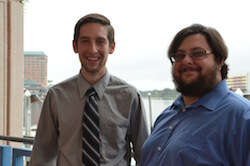 Jesse Mayer and James Anderson, Co-Chairs of the Next Generation Scientists for Biodiesel. Jesse Mayer, from the University of Nevada, Reno, is also a co-chair of Next Generation Scientists for Biodiesel. Originally planning on going to medical, he switched gears when the only lab he could find work in was a plant lab. Well, he got hooked. He said he loves the field and the sustainability aspect of it. Jesse is also graduating soon and if the networking I saw him doing at the conference is any indication, he won’t be on the market long. You can reach him here.